The Union of the Galician People (UPG) is a political party founded in 1964 and defined as “communist patriotic, because it assumes the national liberation struggle”. Around it were bringing together during the seventies sectors which then form the Galician Nationalist Bloc (BNG), in 1982. The resources for production, distribution and credit belong to the Galician people. The countryside association shall start with a cooperative stage, as a first stage to more developed manner of socialisation. Small companies and artisanal industries shall be joined up into larger production units. The administrative organisation of the Galician countryside shall have as its centre parish type groups, that shall be integrated into the Region. Urban areas shall be managed by the Councils, made up from Districts. 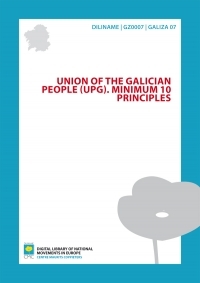 Galician shall be the official language of Galicia, and shall be compulsorily taught. National Galician liberation does underrate Galician federative validity with other nations in the Peninsula. Terra e Tempo, number 1, México, 1965.